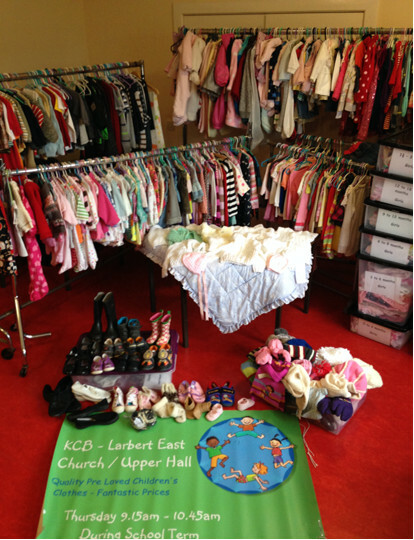 The Young Church at Larbert East Church run an exciting, worthwhile initiative called KCB (Kidz Clothes Broker) but we urgently need your help!! Please tell your neighbours, friends and family about KCB, this project only works if people come along and use us. We are selling quality new and pre-loved children's clothes from birth to five years at ‘give away’ prices. Our small project benefits everyone. Youngsters can have fashionable clothes and parents are not hugely out of pocket. By recycling and ‘Going Green’ we are also supporting our environment and being more 'Eco Friendly'. At present the proceeds are being shared between Larbert East Young Church and Larbert Churches Youth Trust (LCYT). The youth worker for LCYT is based in Larbert High School and works alongside all the Primary Schools in our area. We are currently planning to run a clothing sale every three months - please check back here for further details, or see our Facebook page for all church updates.